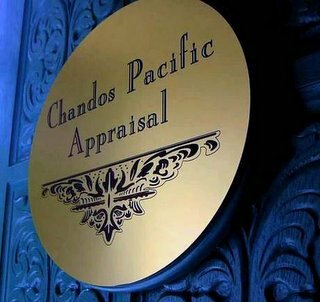 Welcome to Chandos Pacific Appraisal, a premier provider of Commercial Real Estate Appraisal Services in San Diego and Imperial Counties. Since 1991 Chandos has provided appraisal and consulting services to many of the Southern California's top small business bankers and law firms. Chandos is a Practicing Affiliate of the Appraisal Institute and a Member of the National Association of Appraisers with over twenty years of appraisal experience. As Research Director of Grubb & Ellis Commercial Brokerage, Chandos advised a staff of 30 commercial brokers with rapid-fire competitive market analysis, and developed the Real Estate Market Report, an annual economic forecast of Commercial Real Estate, and was the publisher of the region's Shopping Center Guide. Chandos studied with the Appraisal Institute while working with a leading regional appraisal firm before commencing private practice. Academic distinctions include being an American Field Service Scholar in South America, a Georgetown Scholar in Washington D.C., graduating ranked in the top 5% in the School of Economics at Portland State University, and post-graduate studies in Asia. Chandos earned her B.A. in Economics while working at the U.S. Attorney's office and the Law Offices of Stoel, Rives, Boley, Jones & Grey conducting litigation support. Chandos is one of the few commercial appraisers in the region with a professional background from the brokerage and legal communities. This background affords an insider's track into market dynamics and allows the preparation of reports with attention to detail of the legal rights and responsibilities of all parties involved. of the regional retail market. markets in the NW region.